Thank you for your interest in submitting a topic for consideration for the International Roofing Expo 2018 Education Program. 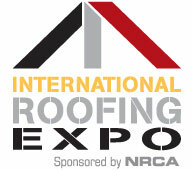 The International Roofing Expo will be held February 6 - 8, 2018 at the Morial Convention Center in New Orleans, LA. The Education Advisory Council will review proposed topics and select courses for inclusion in the education program based on relevancy, overall quality of submission, practical application of ideas and speaking experience of the presenter. The deadline for submissions is April 3, 2017. For questions, contact Brandi.Mcelhaney@Informa.com or Michelle.Rohmer@Informa.com. *Please note that those companies that qualify to exhibit in the show must exhibit to be considered for a presentation.